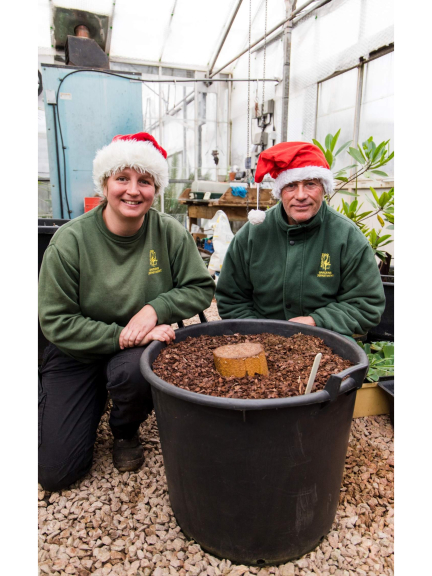 What do zoo gardeners get each other for Christmas? A plant, of course – but not just any old plant. Gardeners at Paignton Zoo in Devon have given their colleagues at Marwell Zoo in Hampshire a Titan arum – one of the largest and smelliest plants in the world. In 2012, Paignton Zoo was the first zoological collection in the UK to have a Titan arum bloom. The gardens team succeeded again in 2015 and saw two more bloom in 2017. They were able to pollinate one of these, and shared seeds with other zoos and botanical gardens. 2018 saw a fifth, Audrey II – the Zoo’s first autumn Titan and at over 235 centimetres, the tallest bud so far. The plant comes from the rainforests of Sumatra and is a member of the Arum family. Its conservation status on the IUCN Red List of Threatened Plants has recently been increased from Vulnerable to Endangered. It has one of the largest flowers in the world; the bloom – correctly, an inflorescence – is green on the outside and bright red inside, with ribbed sides and a frilled edge. Due to its odour – said to be like rotting meat – it’s known as a carrion flower, and has been dubbed corpse flower or corpse plant. It emits the strong smell at night to attract pollinators. Paignton Zoo Environmental Park is a registered charity. For more information go to www.paigntonzoo.org.uk or ring 01803 697500.